It happens earlier each year. The onslaught of Christmas shopping ads, music, and food begins in November. It’s even oozed into October and September. But let’s not get so excited for what’s next that we forget to remember thankfulness. I can’t blame them. Unless you’re a retailer associated with food, Thanksgiving is not a very marketable holiday. It doesn’t involve much buying or selling (other than all that yummy food). No, Thanksgiving is and should be about a feeling, a sentiment, dare I say an attitude of thankfulness. Yet so often we miss this feeling in the the seasonal frantic, food, football, and yes, even family as we gather on Thanksgiving. Thankful and grateful are often used interchangeably. But both depict an attitude, one that often gets overlooked. Yet it’s also one we can cultivate on a daily basis. I’ve completed gratitude journals and written daily notes of thankfulness-both wonderful exercises. But it was a choice to do this, just like our overall attitude is a choice. Interestingly, many older adults who choose to have sunnier, thankful attitudes about life are often those who age well with better cognitive function. Could it be that their attitude helps them with their memory? Hmmm, seems this could be one more reason to choose a more thankful and positive attitude. Maybe it’s because I host our Thanksgiving gathering, but the rush past thankfulness bothers me. In our haste to jump into the rest of the season, we miss the wonderful opportunity to share with those we care about how grateful we are for them, take stock of life and simply give thanks. Society has literally given us a day set apart from the hustle and bustle of the season, yet so many get caught up in Black Friday frenzy, focus on the food and forget thankfulness. Instead, let’s choose to remember. Remember the good, learn from the bad, and be thankful in and for it all. 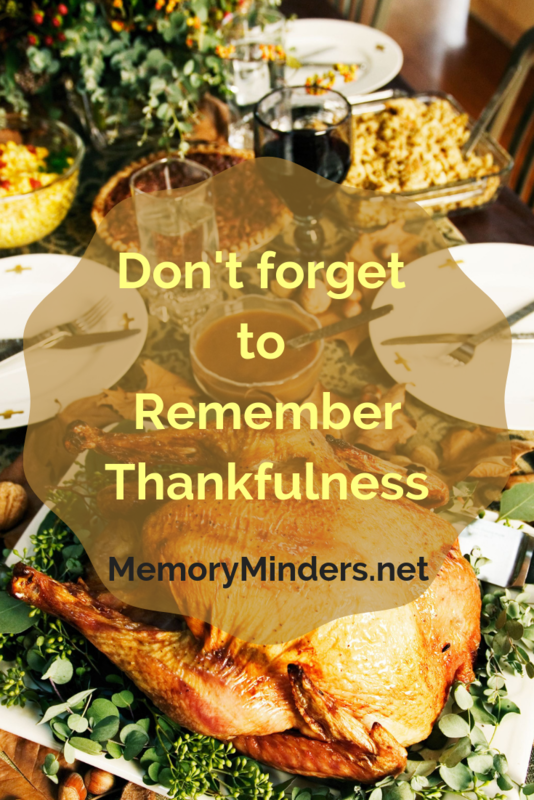 An attitude of thankfulness will serve us (and our memories) well, on Thanksgiving and all year long. But it’s a choice. Choosing a grateful attitude doesn’t dismiss what’s wrong or skip over hurt, anger or pain. It simply is a choice to be grateful for what we have and pause to honor it. There’s plenty of time for the rest of the craziness, joy, and merriment of the holiday season. Take a few moments or the whole day this Thanksgiving. Let’s not jump ahead and forget, but pause and remember thankfulness.